As a 5-year-old growing up in Winchester, Va., Arthur Hyde ’77 sat in his front yard and recited the makes and models of cars that drove past his family’s white, two-story brick Colonial, among them Packards, Chevys, Fords—even the ill-fated Edsel, which had just hit the streets. Hyde’s passion grew as he continued to watch the motorized cavalcade roll through the town famous for changing hands 72 times during the Civil War. Then, in the summer after third grade, came the moment that changed his life. It was at the 1964 World’s Fair in New York City, where a new creation, the 1965 Ford Mustang, was unveiled to the public. Named after the famous World War II fighter, it had a base price of $2,300. Ninety minutes later, the giddy brothers finally crawled inside the Guardian Blue convertible’s vinyl sanctum. The car, suspended above a pool of water, took the boys on a short, automated ride in the Ford Pavillion. For Hyde, the moment was indelible—even sacrosanct. Hyde never wavered from his plan to take Mustang by the bridle. At WPI, he called and wrote to Ford’s then-executive engineer, Bob Alexander, a dozen times. The queries went unanswered. But Hyde wasn’t deterred. He found a Ford annual report and looked up the names of other company executives. He wrote more letters. Someone finally took notice and Hyde ultimately scored an interview with Alexander, himself, who was impressed enough with the young engineer to give him a job that, in part, required him to work on turbo-charging the engine of the Mustang that was to serve as the 1979 Indianapolis 500 pace car. He was the perfect guy for the job. At WPI Hyde conducted research on automotive turbo-charging—increasing an internal combustion engine’s efficiency and power output by forcing extra air into the combustion chamber. For his MQP, he explored the impact of turbocharging on fuel economy and emissions. But his ultimate goal took some time to realize. That dream came true in 1998 when Hyde became Mustang’s chief program engineer. These days, Mustang fan groups regard Hyde with rarified esteem. The Mustang Club of America (MCA) inducted him into its hall of fame in 2002 for saving the car. “It’s a huge honor,” Hyde says. He served on the MCA board of directors from 2000 to 2004. During those years he penned a monthly column in the club’s magazine, Mustang Times. 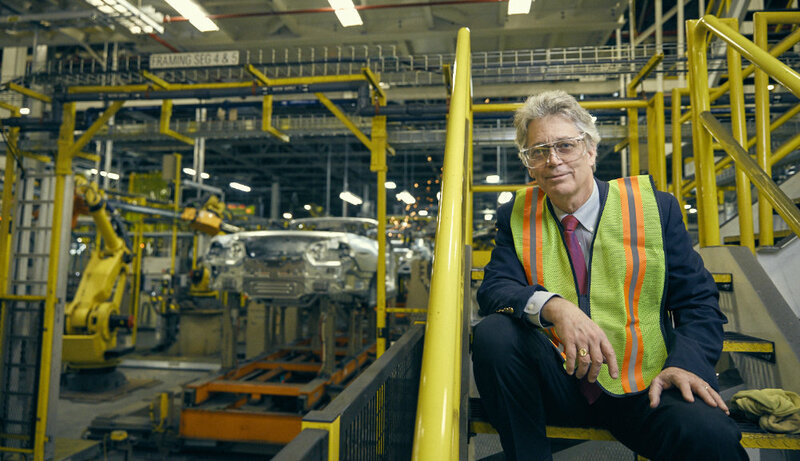 Forty years on, Hyde is still at Ford’s Dearborn, Mich., headquarters. He’s been the only engineer to helm two Mustang programs—SN95 and S197—that produced the car’s fourth and fifth generations. After leaving the Mustang program in 2002, he resumed his previous role as chief engineer for Ford’s global product development system. “Fundamentally, I’m responsible for making sure every program is on time and that it’s not consuming too many engineering resources,” he says. “We want to hit that budget.” This year he’ll travel twice to China, Brazil, and Australia. His itineraries include four stops in Europe, and another in Japan. Hyde also is an adjunct professor at the University of Michigan’s College of Engineering, where he teaches systems engineering and program engineering. He’s taught in Ann Arbor since 2001, at the invitation of the department. Building cars involves “a very critical set of skills that we want to give our students,” says Panos Papalambros, chairman and professor in the college’s Division of Integrative Systems + Design. “You cannot replicate that in school, but you can prepare them so they can be ready for the experience when they go to work. Hyde is considering retirement, but there’s still the spirit of that car-loving 5-year-old reminding him that some passions never die. Hyde was as much a grease monkey as a student during his Worcester days. He canvassed the city and the campus, leaving business cards on windshields advertising his skills as a mechanic (something he began doing in the seventh grade). He particularly enjoyed working on British sports cars. As for his own wheels, he drove a brown 1970 vinyl-top Ford Capri during his college days, in which he installed a racing-style Formula Ford engine. He pined for his dream car, but his father had forbidden him to get a Mustang because of hefty insurance costs. As a middle schooler, Hyde found an old 1966 Datsun 411 SSS, but it was inoperable. In the summer after eighth grade, he hitchhiked regularly to the yard until he got it running. He somewhat abashedly admits to owning four cars: his daily driver, a Ford Focus ST; a 1999 Mustang that was used for testing and development purposes; a 1967 Lotus Elan (“It’s a British model, right-hand drive, the way it should be”); and, for thrills, a 2015 Shelby GT350R (“It’s a hell of a car!”). But Hyde doesn’t necessarily find satisfaction in speed and muscle. He’s an engineer at heart. His role with Mustang also tested his political chops, particularly during those days when the Mustang appeared to be a dying breed. In a controversial move, Hyde launched a program called “immersion excursions,” in which executives and engineers spent a day with Mustang owners around the country. Those owners were given video cameras to film a week in the life of their Mustangs. He says one, a homeless man in Newport Beach, Calif., has stuck with him over the years—his situation showed that Mustangs are more than just four wheels and a chassis. “He lived between two houses and had a corrugated roof over his head,” Hyde says. “He had a couch, water-cooled speakers for his stereo system, and nothing else. But the guy did have a Mustang convertible, and everything he earned he put into his Mustang. It was hopped up; it was beautiful!